A dentist appointment is universally dreaded. But Dr. Hatami makes it as pleasant as possible. He talks through any treatment/care plan, is always smiling and joking, and I actually look forward to be seen by him. Thank you, Dr. Hatami! A dentist appointment is universally dreaded. But Dr. Hatami makes it as pleasant as possible. He talks through any treatment/ care plan, is always smiling and joking, and I actuallylook forward to be seen by him. Thank you, Dr. Hatami! He explained a lot and helped me understand my teeth and how my health was. He was also very personable whichI enjoyed as we talked about Florida and the bay area. However his office staff and overall experience was average. The front desk ignored me - I had to ask for paperwork to fill out instead of being told to fill it out. And then I didn't go back to the dental work area until 30 mins after my scheduled appointment. He explained a lot and helped me understand my teeth and how my health was. He was also very personable which I enjoyed as we talked about Florida and the bayarea. However his office staff and overall experience was average. The front desk ignored me - I had to ask for paperwork to fill out instead of being told to fill it out. And then I didn't go back to the dental work area until 30 mins after my scheduled appointment. Dr. Kurosch Hatami was born in Nurnberg , Germany and has lived in the bay area for over 31 years. After graduating from Monta Vista High School , Cupertino , he attended the University of San Francisco receiving a Bachelor degree in Biology. Dr. Hatami went on to receive his Doctorate in Dental Surgery from the University of the Pacific, in San Francisco . 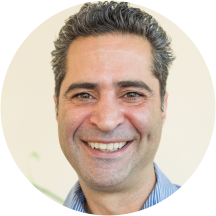 Dr. Hatami went on to practice dentistry in the Bay Area for the last 21 years. Dr. Hatami’s treatment philosophy begins and ends with preventative care. “The benefits of good tissue management provide the basis for healthy supporting structures of the teeth. Healthy gums and bone have far reaching benefits to the dental and overall physical health of patients. “ Dr. Hatami is very enthusiastic about the plethora of restorative options available to patients. In his private time you may find Dr. Hatami enjoying time golfing and biking. He also has been a fan of soccer as a spectator as well as a participant since childhood. The office is a little run down, but Hatami is very friendly and explains everything. Great dentist, very thorough, takes his time, helpful and doesn't try to upsell you on unneeded cosmetic stuff. Would highly recommend. I had a great experience today. I had to book an emergency visit and they were able to schedule me and see me right away. They were very accommodating. The staff and doctors all were very nice and professional. I would definitely recommend this place. Friendliest staff I have yet to encounter. Diego is amazing. Amazing staff, extremely friendly and professional. Very impressive process and equipment. Explained and clarified every step they took. Made the whole visit extremely fun and efficient! Great experience. He explained everything he was going to do and was very friendly. Dr Hatami is the best! Fast, professional, explains the process and gives detailed diagnosis and advice on best treatment options. Great staff in the office too. Had a filling done and was rushed out to the "cashier". Had to insist to go back and that some of the edges are polished first. That was also rushed and food kept getting stuck. I ended up going to another dentist to get the whole thing redone. Dr. Juan is wonderful! She is meticulous about her work and was able to identify several issues that previous orthodontists never even addressed. I would highly recommend the Dental Zone team! The visit was fast and efficient. Dr. Hatami is always friendly and professional. Aman, the assistant, was very patient in getting the stain out of my teeth and gave me good advice. Thanks to everyone at Dental Zone! I really enjoyed my visit with Dr. Hatami. He answered all of my questions and explained a great deal of dental science to me as we went through my x-rays. Viewing the X-rays was very easy too as he had aTV to display them easily visible from the dental chair. I was very impressed with how quickly he saw me and the depth of care. still waiting for the call with estimate ? Very personable, experienced and professional. Wonderful doctor and terrific staff! Professional, no-nonsense approach. Believes in conservative, minimally intrusive (and expensive) approach to dentistry. Great doctor. Really down to earth, easy to talk to. Good! Wish the wait time was not so long though. Love him! Best dentist I've ever had. Best dentist I've seen in a long time. He explained all issues to me in a calm manner, alleviating any anxiety I might have. He also performed the cleaning himself because he wanted to be extra careful and thorough. Financing staffwere clear in explaining my share of cost and were flexible with my schedule to arrange follow-up appointments. Very highly recommend! Dr. hatami is extremely friendly and professional. His entire staff makes you feel welcome and well taken care of. I'm very happy to have found Dental Zone.